Let's stop worrying about earthquakes and hurricanes (and, for the east coast, natural disaster inferiority) and devote some time to the problem of the giant, possibly mutant rats living underneath our buildings. 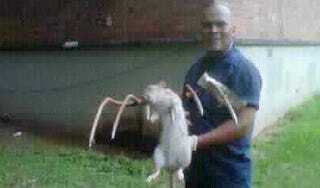 The creature you see dangling from this hero's pitchfork (he's identified as Jose Rivera, a Housing Authority employee) is one of multiple Gambian pouched rats reported to live under the Marcy Houses in Bed Stuy, Brooklyn. They're "nocturnal, can grow to three feet and four pounds or more, and live seven or eight years," the Daily News reports. In short, they probably pop rat poison like Chiclets. Imports [of the Gambian pouched rat] have been banned since 2003, when they were blamed for a monkeypox outbreak that sickened 100 people in the United States. Dr. Paul Calle, director of zoological health at the Wildlife Conservation Society, said the Marcy Houses specimen was probably an escaped or discarded pet who decided to join the regular rat race. "They are a very social animal and live in big groups in the wild. Our Norway rats are the closest big rodents it could accompany," he said. They can even be trained to sniff out landmines or even tuberculosis. "They're pretty remarkable animals," Calle said. Tenants fear that the Gambian rat has been breeding with the Norway rats and spawning a super-breed of rodents — but zoo officials say not to worry. But no one told the cats not to worry. "Even the cats are afraid of the rats," Marcy resident Stephanie Davis told the Daily News. "They get together and gang up on the cats." So yes, stay calm, New York, and don't worry about the giant, possibly mutant rats until after the hurricane, when they emerge from their giant mutant rat holes into an apocalyptic landscape and go to war with our city's stray cats. Everything's going to be fine.